These vineyards were created in 1330 by monks of the Holy Spirit Order. 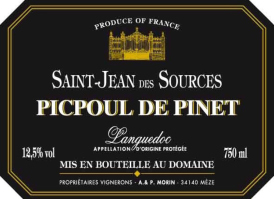 Stretching along the Thau lagoon to the west of the Mediterranean’s Golfe de Lyon lies the largest white wine producing area in the Languedoc – the Picpoul de Pinet terroir. Located on a sunny limestone plateau, the climate is hot and humid with abundant Mediterranean vegetation bordering the vineyards. Fresh herbs and scattered pines grow abound. Limestone and sandy soil deposits – along with the cooling sea breezes – create these extraordinary white wines.